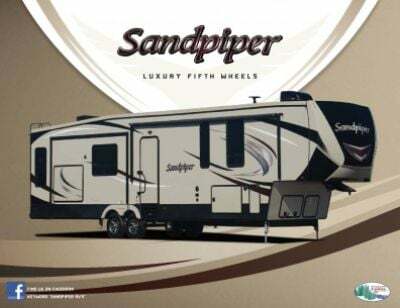 The 2018 Forest River Sandpiper 38FKOK 5th Wheel is one terrific RV - and at National RV Detroit, you can own it at a price that will amaze you! We've been selling the top brand RVs in Belleville since 2008 at wholesale prices! Stop in and see us at 44700 N I 94 Service Dr Belleville Michigan 48111 and we'll save you $1000s! Even if you don't live in the Belleville area, or in Michigan, our personalized phone and online service and 24/7 delivery across North America mean you can have this great RV at your door in no time! This model is very road manageable, with a hitch weight of 2256 lbs. The retractable 20' 0" patio awning reduces wind resistance while you're traveling, and the sturdy GVWR of 15500 lbs. means years of camping fun for the whole family. 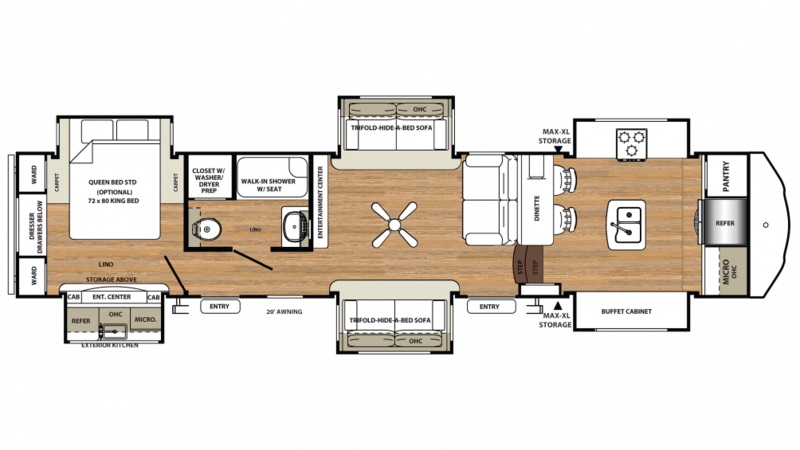 The living area in the Sandpiper 38FKOK is roomy and comfortable and will accommodate your whole family! It's 41' 8" long, 8' 0" wide, and 13' 2" high! If the weather turns to bitter cold, you'll stay cozy and warm inside thanks to the efficient 35000 BTU furnace! And the modern 15000 BTU a/c unit will keep everyone cool and comfy on those sizzling hot summer days! Do you love making tasty meals for your family, but find it challenging when you're on the road? Well, not anymore, thanks to the modern kitchen in this 5th Wheel! The convenient 9.00 cu. ft. refrigerator can hold meats, veggies, eggs, and cold drinks, and you'll cook delicious breakfasts, lunches, and dinners on the 3 burner range cooktop that'll keep your family smiling! You'll be able to clean, drink, and cook with plenty of water from the 60 gallon freshwater tank! Who likes trekking across the campground to the chilly, damp, even messy community bathroom? In the Sandpiper 38FKOK, you won't have to! It's roomy, private, and has a handy, sanitary Porcelain Foot Flush toilet, full sink vanity, and shower! This RV also has a 134 gallon gray water tank and a 52 gallon black water tank.